Fluoride is a tiny molecule and challenging to remove. Selecto has met this challenge with their patented ABA2000 ceramic media which reduces fluoride by 75%. Currently the EPA allowable limit for Fluoride is 4ppm (parts per million or milligrams per liter.) (2 ppm. for children. See below.). If your water has 1 ppm or higher you may want to reduce it by adding a Fluoride reducing cartridge. 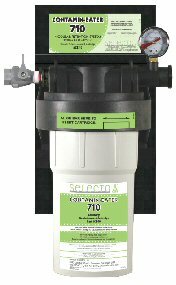 If you are buying a double cartridge Contamin-Eater or a Legacy filter for drinking water, you may add the 710-FL Fluoride reducing filter under your sink at a discounted price. If you are purchasing a single cartridge Contamin-Eater for your whole house, you can add a Fluoride reducing filter of the same size in conjunction with your whole house filter. Lobby your state or municipal water department to cease adding fluoride to your water! To be used in addition to a Drinking Water Filter or Whole House Filter. 15% Discount and free shipping when purchased as an “Option” with any Contamin-Eater Whole House water filter. 15% Discount when purchased as an “Option” with any Contamin-Eater Whole House water filter replacement cartridge. May be installed into cold water line or dedicated faucet. Faucet will determine Flow Rate. on all Contamin-Eater Water Filtration Systems shipped in the US! All non-US residents please email donna@ezclearwater.com or pick up the phone and call ezClearWater at 678-696-8109 or 678-936-1274 to discuss discounted shipping rates. If you have not yet decided whether or not you believe you should reduce your consumption of Fluoride, you may find these links helpful. Fluoride. Many communities add fluoride to their drinking water to promote dental health. Each community makes its own decision about whether or not to add fluoride. EPA has set an enforceable drinking water standard for fluoride of 4 mg/L (some people who drink water containing fluoride in excess of this level over many years could get bone disease, including pain and tenderness of the bones). EPA has also set a secondary fluoride standard of 2 mg/L to protect against dental fluorosis. Dental fluorosis, in its moderate or severe forms, may result in a brown staining and/or pitting of the permanent teeth. This problem occurs only in developing teeth, before they erupt from the gums. Children under nine should not drink water that has more than 2 mg/L of fluoride. NOTE: We realize the fluoride reducing filters are expensive, but fluoride is difficult to remove and these are expensive to produce. We try to help by offering the 15% Discount when you purchase the Drinking Water Fluoride Reduction filter in conjunction with a Contamin-Eater Whole House filter. Our Whole House and Drinking Water Filters are proudly Engineered and Made in the U.S.A.